I have 3 cards to share today, all for the Creative Moments challenge and all using digis designed by Kristyn McInnes -Buckingham, from her Oz new release at My Stitch Back In Twine. The first card uses and was was coloured red using a Ruby Promarker before have glitter glued on. 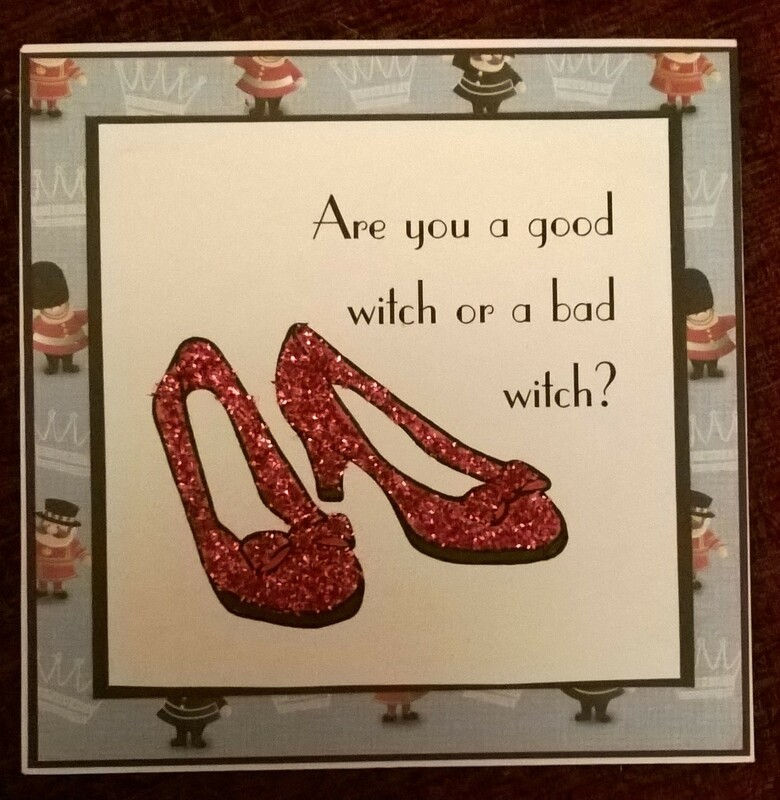 The backing paper is vintage Kanban, but it reminded me of the wicked witch’s guards. 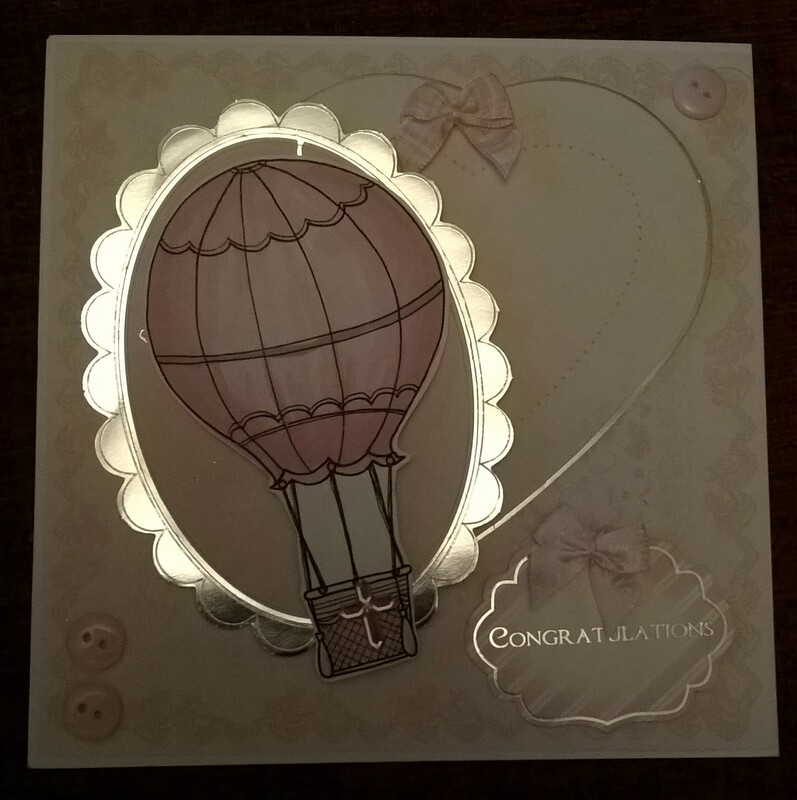 Next, I have used Papermania capsule papers and embellishments in Wild Rose and used Promarkers to colour The balloon. Silver accents were used and i added a pink cross and congratulations sentiment so the card could be used for a church wedding or baptism. Last but not least, Poppies! Simply coloured using Promarkers again, this image was cut out and mounted onto black which enhanced the littered black centre of the flower. Sorry it has been a while since I last posted. My Laptop has died so I have decided to post here today using my ‘phone. 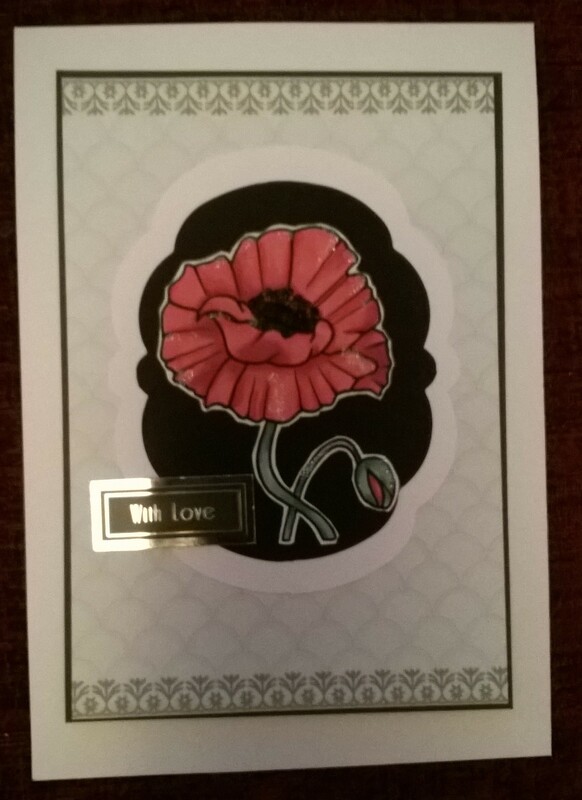 I made this card yesterday using DoCrafts products apart from the card base which is from Dovecraft. Anyway, it has been quite hard work so I might not post again until my laptop is fixed. I will be back though! This is one of my Easter cards this year. I have made the decoupaged topper using DoCrafts products and the Blessings wording is a Clarity stamp that has been embossed in silver to match the mats behind the topper. I have used Papermaina’s Folk Floral range for today’s card, which was made for my dear Grandmother. I printed the sentiment then used a frame from the range to mount it. The flowers were die-cut as part of a decoupage sheet but were perfect as final embellishments on the card. Mothering Sunday is fast approaching and this card is made using the Simply Floral range from DoCrafts. The flowers are decoupaged for dimension and then layered over the decorative border. Forever Friends is such a sweet brand. I remember them being introduced in the early 90s. I have used Docrafts products to make this card on a black card blank. I have made a series of hanging hearts for St. valentines day and Mothering Sunday. All the papers and tags used are from Docrafts and I have just added the white lace and the flower on the third heart. The fist two hearts are made with the Simply Floral collection and the flowers were cut out by hand and decoupaged using foam pads. The hearts are whitewashed wood and were purchased inexpensively from Country Crafts.